This post is translated from here: internet menggunakan maxis broadband [Bahasa Melayu]. 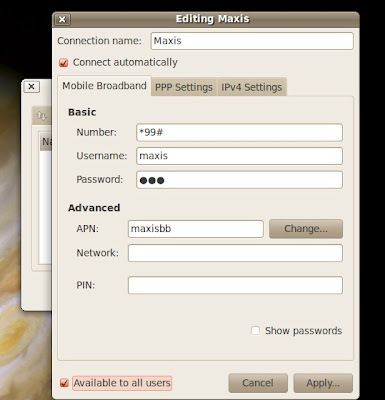 This post demonstrates how to connect to the Internet using Maxis Broadband via the VMware player. 1. Make sure the VMware tools are installed. Otherwise Ubuntu fails to detect the modem. 2. Click the toolbar of the VMware player > VM > Removable Devices > Huawei USB Composite Device > Connect (Disconnect from host). See Pic 1. Pic 1 - Refer Step 2. Disconnecting the modem. 3. Unplug the modem. Then replug the modem. Without this step, Ubuntu fails to detect the modem as shown in Pic 2. Pic 2 - Refer Step 3. Modem undetected by Ubuntu. 4. On the upper panel, right-click the NetworkManager icon > Edit Connections... > Mobile Broadband tab > Add button. 5. Follow the on-screen setup instructions. Then click the Apply... button. See Pic 3. Pic 3 - Refer Step 5. Follow the instructions. 6. 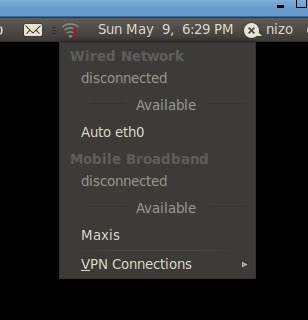 Again, on the upper panel, click the NetworkManager icon > Maxis. See Pic 4. The modem will start to blink and connect to the Internet. Pic 4 - Refer Step 6. Select connection.